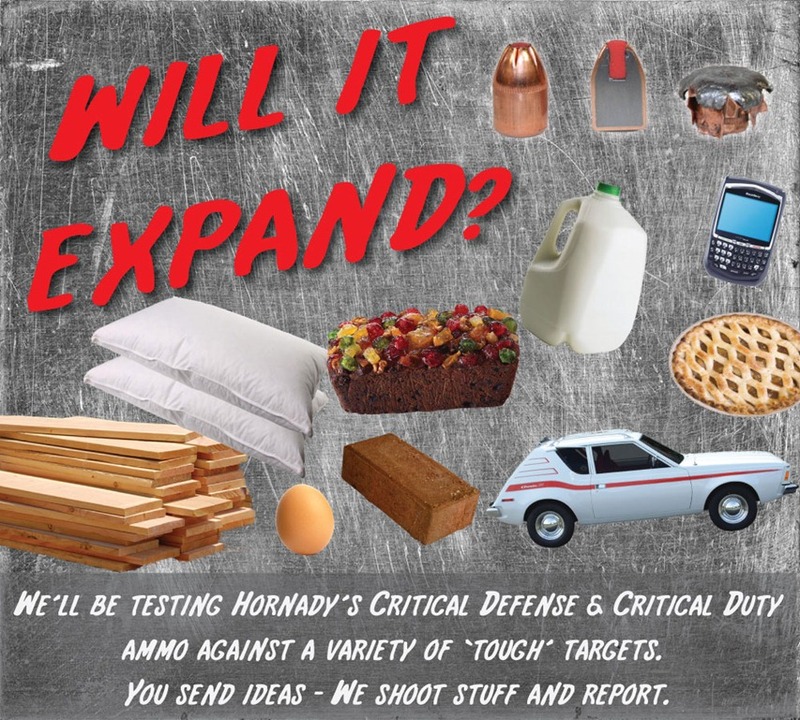 You are here: Home / Ammo / Hornady’s Critical Defense Ammo: Will It Expand? You Suggest, We Test! Hornady’s Critical Defense Ammo: Will It Expand? You Suggest, We Test! Inspired by our recent review of Hornady’s Critical Defense ammunition in .357 Magnum, we’ve decided to kick things up a notch. We were pretty impressed with how this ammo expanded even after passing through hard barriers. So, with some help from the good folks at Hornady, we’re going to really put both Critical Defense and the new Critical Duty ammunition to the test. Yup. We’re going to shoot stuff. A lot of it. With a lot of different guns. It’s a tough assignment, but someone has to do the dirty work. We do things a little differently here, so we’re not going to stick to the basic denim in front of ballistic gelatin routine. That’s boring. And gelatin is a pain to make. We’re going to see how this ammo performs in a wide variety of, umm, real world scenarios. Real world in our slightly half-cocked view anyway. So what do you think? Will it expand in cottage cheese? Kleenex? Old shag carpeting from the 70s? Fruitcake? Sand? Justin Bieber CD’s? A Shake-Weight? So send your ideas. Either comment on the post, contact us, post it on our Facebook wall, or Tweet us about it. We’re ready. And willing. I’d also like to see standard around the house objects to see how they fair as cover…. namely a mattress. We hear conflicting opinions on if a mattress is suitable for cover or not but I have never seen any penetration testing. Perhaps a reinforced door would be interesting too. As to the random and absurd…. a giant cheese wheel, giant jar of baked beans, a basketball, play dough, a keg of beer, sand, anything thick and gooey, and since you are in the south…. how about a giant vat of grits! Excellent suggestions all! Grits are absolutely going to be a part of this 🙂 Both dry and cooked! I second the request for the .380 round, considering the proliferation of the LCP/TCP/etc pocket pistols. While I am carrying the Critical Defense Ammo, I have not seen any studies aside from the Manufacturer. My house object would be a steel house door, as in, is it reasonable for me to be able to defend thru one vs. a possible Home Invasion. Car door, windshield, 2 cases of potato chips (unboxed), maybe a slurpy machine, 12 pack of plastic soda bottles, a cash register, 6″ of pig fat as an analog (for some of us)… I can see ramifications for all of those in real life, so nothing absurd on my list. As a secondary caliber, .40 would be my next step, but I’d have to get that off of the shelf.